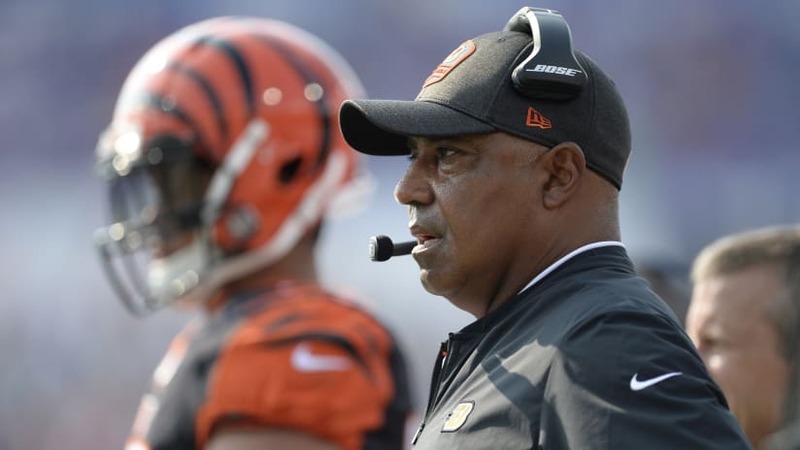 Marvin Lewis went with some veteran coaches in the offseason. Cincinnati mayor John Cranley called Wednesday “Cincinnati Bengals Day,” in his city. Friday at Paul Brown Stadium was Bill Lazor Day. 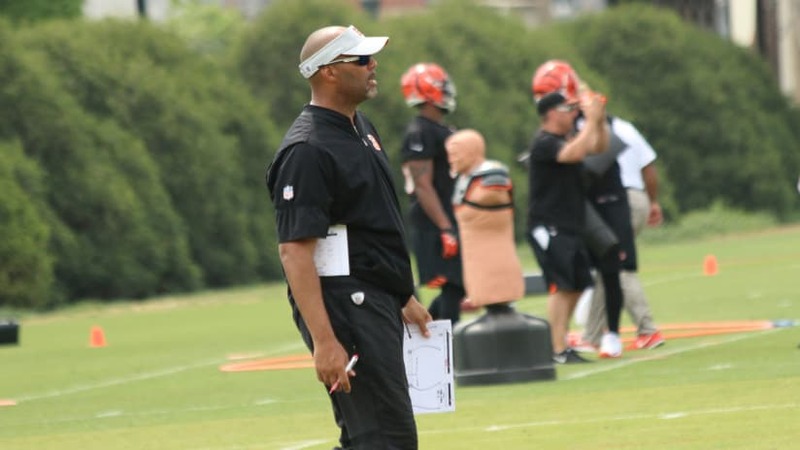 It will be recalled that a year ago Friday, the day after the Bengals offense failed to score a touchdown for the second game in four days, Lazor, the club’s quarterbacks coach, was also named offensive coordinator in the wake of Ken Zampese’s firing. He spent that day and the weekend scrambling to get ready for the Packers game in Green Bay with a playbook in shambles. It might have been at that point an exercise machine was installed in his office because he was planted. “They probably cancelled this last year,” said head coach Marvin Lewis with a not so ironic laugh at his day-after-game news conference. completing 55 percent of his passes for six yards per throw with a horrific passer rating of 47.2 mirroring it all. interception while completing 64.3 percent of his passes at 7.3 yards per throw for a just as indicative 108.5 passer rating. It looks like Lazor is striking a balance in his offensive brew of ideas that looks to be, in some sense, Don Coryell meets Chip Kelly. Maybe not when it comes to run-pass ratio. Which is 48-70. But when it comes to formations and distribution. According to the NFL on 20 first-and-10 plays, Lazor has lined up in a set of two-receivers and double tight ends. On 21 plays of first-and-10, it’s been three receivers and one tight end. Six receivers have caught at least four passes: two wide receivers, two running backs and two tight ends. Lewis spoke from the same place Friday where he spoke in January when he told the disbelieving pundits he was going to change it up. He ripped up the offense and not only that, he brought in a veteran defensive coordinator (remember Mike Zimmer in 2008?) and Teryl Austin came in breathing fire about turnovers and pressure. Those were two categories that had slipped during the two-year fall from the playoffs. Now look. The defense is on pace to generate 40 turnovers for the first time since 2005 and salted away both wins by recovering a fumble in the final 2:25 a year after they recovered three fumbles all season. Teryl Austin preaching pressure and pop has got them turning over the ball again. Lewis hung with Lazor because he liked how comfortable he made Dalton play the rest of the way and charged him with giving him a playbook that elaborated on Dalton’s strengths. He needed some continuity because he was moving on from the only offensive line coach he ever had. Near the end of the interviews to replace Paul Alexander, Cowboys head coach John Garrett finished off a purge of his own and let go highly-regarded line coach Frank Pollack. Pollack, who developed a first-round into Pro Bowlers in Dallas, had the pedigree Lewis sought. Being a fiery former guard didn’t hurt, either, and when Lewis put on the full-court to sign him, Pollack got just the right pitch because he didn’t make any other visits. Pollack promptly changed the culture of the line and gave recycled veterans like right tackle Bobby Hart and right guard Alex Redmond a second chance. On Thursday they stood up to the big, bad Ravens front seven, not only keeping Dalton clean but running the ball for just about four yards per carry (3.9) against a Baltimore defense that doesn’t usually let that happen. In just one example of how a different (not better) approach has helped, Pollack apparently cut down the number of rules linemen had to follow in response to the Ravens’ blitz. He seemed to feel simpler was better. Prior to the game I wrote about the Bengals looking for revenge for last seasons 20-0 shutout in much the same way the Ravens wanted revenge for being bumped out of the playoffs. IMO the only difference was the media was all over the Baltimore storyline. Blinded by the Ratbirds blowout of Buffalo they all but ignored the staggering short and long term impact last seasons opener had on the Bengals and the near certainty the Bengals would want some revenge of their own.